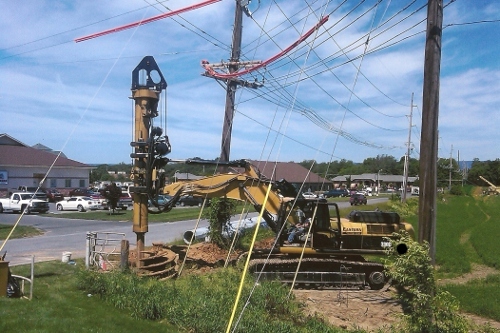 In June 2011 Eastern Caisson completed a turnkey foundation for a steel transmission pole for the Borough of Chambersburg, PA. The job consisted of drilling a 72″ diameter caisson 25′ deep thru 10′ of rock. Eastern Caisson supplied and placed temporary casing, the rebar cage and concrete, placed and aligned the anchor bolts, formed the caisson above ground, and hauled the drilling spoils from the job site. What made the project unique was the proximity to existing overhead power lines and guy wires, working along an existing roadway, and the rock excavation. Eastern was capable of performing the work by utilizing its low clearance drill rig consisting of a CAT 330DL with a Bay Shore Systems LoDril DH60 attachment which provided the necessary clearance from the power lines and the power to excavate the rock within the estimated time frame.